Quang-Tuan Luong, Phd., is much more than a world-class photographer. From a technical climber to a mountain guide to a University professor and contributor to the fundamentals of artificial intelligence, Quang-Tuan has found his own way to professional photography. 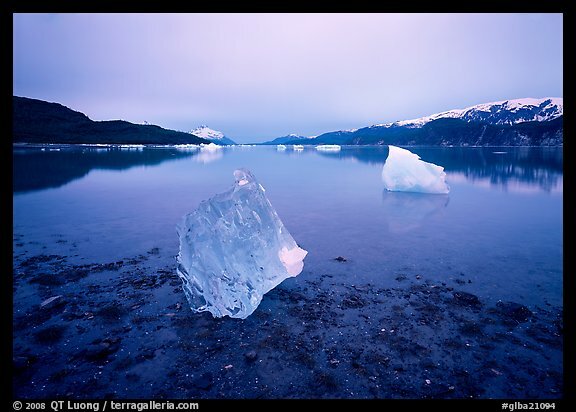 His site, Terragalleria, is the most frequented of any individual photographer's site on the internet and he now earns his living entirely through business brought in through the Internet. A complete bio of Quang-Tuan Luong is available at Terragalleria . To say you have achieved some impressive traffic figures for your web presence is an understatement. I suspect your heavy traffic is a result of extensive text-rich content coupled with time. What do you think is a realistic amount of time to allow in building up enough traffic to turn a photography web site into a money-making endeavor? It will easily take several years. There is this rule in the US that you have to show profit 3 our of 5 years in order for the IRS not to classify your business as a hobby, so I when I officially started my photography business (and the website) in 2001, I was anticipating that by 2003, my revenues would surpass photography expenses, which is what happened. In 2004, traffic (as measured by Webalizer, which overestimates maybe by 2/3 compared to Google Analytics), passed 10,000 daily, and revenues reached the six-figure milestone. So for me it took three years to turn the site into a viable business. However, I was not starting from scratch, as I've had a presence on the internet since 1994, under the form of a fairly popular personal site dedicated to climbing and mountaineering - the contents were absorbed into the terragalleria.com site in 2002. Keep also in mind that it was easier, maybe much easier, to build traffic a decade ago. Back then, there were just a few photographers, the most notable of them being Dan Heller, who understood that you could effectively use a website as an effective pull marketing vehicle. Not many understood even SEO basics. You needed technical knowledge to build a site. There were no blogs or ready-made image galleries. Nowadays even fairly advanced SEO features (some of which I have yet to implement on my own website!) are built-in as a standard issue in a service such as Photoshelter, which, last I checked had more than 50,000 accounts. That's a lot of competition, so I expect it will take longer than three years if you are starting now. I have noticed that sites such as yours that draw significant numbers of visitors seem to do so from a large number of search terms…I guess you would say a lot of long-tail keyword hits. Is that the key to building traffic? What other strategies can photographers employ to build their success on the Internet? How do you divide your time (i.e. between shooting, making prints, administration & Internet work)? Shooting time has been in the 10-20% range. I don't have a clear breakdown for the office work, but I am spending a considerable amount of time to create high-quality digital files. Do you get more revenue from fine art prints or stock licensing? Half a decade ago, revenue from licensing was larger. At one point, a few years ago they became even. This year, I am seeing a sharp decline in licensing, which is now well surpassed by prints. Like everybody, my licensing fees have eroded, but on the other hand, I've steadily raised prices for my prints and so far they continue to sell well, maybe because my reputation as a artist is growing. I see you have Google ads on your site. Is that a significant source of revenue? I started to use Adsense in 2008 at the urging of friends. I am still unsure whether it is worth it and I am always thinking of leaving the program altogether, but in this climate it's not that easy a decision to drop a source of revenue that adds to diversification and doesn't require any effort on your part. Can you share with us the percentage of your income from prints vs. Stock licensing and web advertising on your site? Do you have other sources of photography income? I'd be tempted to say none, but that would be slightly inaccurate. I have a few hundred images with a small French stock agency. The agency owner is a real "agent" (unlike the big stock houses) who was willing to help me when I got started, which is the main reason I haven't pulled out the images although they don't generate any significant income. I think that's pretty much it. So far I have not taught workshops, done consulting or writing, or sought assignments and/or commercial jobs. This has allowed me to concentrate on making the photographs I wanted to make. One of the most vexing problems for me is how much to charge for my work. How do you go about pricing yours? I am certainly not the best businessman around, and I am sure I've lost many licensing opportunities, as I use a simple method and have an inflexible minimum fee, which is fairly high. I check the Getty, Alamy, sometimes Corbis rates as well as the rates I've obtained in the past. Then I try to evaluate the request individually to understand the value they are actually getting from the use, and give them a discount accordingly. Does it take much work to keep your traffic high, or does traffic beget traffic? It's true that the more traffic you have, the more people link to you, and probably the more search engines weight you. This creates a positive feedback loop, which makes it very difficult to displace the most trafficked sites. Yet, I am not taking chances. I constantly add new images (at least 2,000 per year), pages to the site, and often new features as well. Can you share one of your favorite photos and the story behind it? On the first day of our ten-day sea kayak trip, we had gotten up at 6am. destination, a grassy flat near the mouth of McBride Inlet, at 2am. in after being awake for almost 24 hours. What photography project is currently at the top of your list? It's been winding down, but I am still working most actively on the National Parks project. What advice would you give aspiring photographers? Shoot what you love, not what you think may sell. I think it is shortsighted to shoot only what you think will sell. First, because you don't know with any degree of certainty what sells and what doesn't. Second, and more important, because, as an artist, what you should be trying to create is raising your profile. This is done by producing outstanding work, which is awfully difficult if you don't love what you are shooting. By the way, I am taking my own advice. Personally, I never expect all the images I publish on the website to sell. They are there because I find them interesting for some kind of reason. What advice would you give photographers who want to have more effective web sites? Have a clear goal and a path to realize it. I see a lot of photographers trying to achieve all sorts of things with their websites: stock licensing, print sales, getting assignments, you name it. Yet when you analyze the components of their sites, you see that none is particularly effective for any of those goals. For instance, since you are a stock shooter, you know that stock is a numbers game. Yet many do not even design in order to maximize traffic. Facebook is capturing an increasingly greater percentage of web traffic. Are you utilizing Facebook (or any other social media), and/or do you have any opinions on the importance of incorporating a Facebook presence into a photographer's strategy for visibility? I've been testing the waters but I remain skeptical of the value. On FB I have only a personal page because I do not like the idea of an artist setting up his own fan page - although from a SEO point of view it does make so sense. For status updates, I prefer twitter, there seems to be more information and ideas flowing around. Do you utilize flickr or other photo sharing sites (and if so how)? No. I would if I had the time. Do you promote yourself outside of the Internet? Just a few years ago, I suddenly realized that as a visual artist, you have to exhibit your prints, because, even in this day and age, the print remains an ultimate realization of your work. So although I have a short exhibit history, I've been trying to catch up. Other than that, I've never sent any promo piece or solicitation to anybody so far. Unlike some, I don't really like to promote myself or even to sell. With that respect, my Internet strategy was a good match. What qualities in you are most responsible for your success as a photographer? Same as the qualities that were responsible for my success as a scientist: curiosity, persistence, ability to grasp the "big picture" and at the same time take care of details and technicalities. Where do you want to shoot that you have not yet been to? Everywhere (truly, even in the US Midwest!,) but especially in the Himalayas, South America, Africa, and Antarctica. What is your biggest challenge as a photographer? To create work which is fresh and meaningful. There is so much great work that has been created in the past and right now, it's difficult to find new ideas. When one tries to shoot with a new style or new techniques just to be different, it often ends up being gimmicky. To understand emerging trends in business and technology and take advantage of short windows of opportunity. If I hadn't understood the importance of search engines on the Internet a decade ago, I wouldn't be there today. However, nowadays, everybody is doing SEO. So what's next? Are you optimistic or pessimistic about your future in photography? I am optimistic about my future in photography. I feel I still have so much to learn, so much room to grow that the journey is going to be very rewarding. It could be that ten years from now, I will be at a very different place, and doing very different work than what I've been publishing so far. What I am not necessarily optimistic about is the business of photography. Although the year is not finished yet, at this point it is a given that for the first time in 10 years I will experience a decline in revenue. There are some worrisome economic trends that you know well. Historically photography has not always supported that many full-time practitioners, and we might return to that situation in the future. But that's OK. Some of the most enduring and celebrated work in photography didn't sell well at the time it was created. Great writeup John - and Quang-Tuan. Thanks to both of you. Thoughtful and specific questions with very straight forward answers. QT, I see similar general overall trends in my business. Keep up the good exchanges guys. I'm in almost 100% agreement. Thank you for sharing your insights with us. Great interview! Very informative. Thank you. I've been an admirer of QT's photography (and website) for years, and was recently happy to see him featured in the Ken Burns National Park film. Very interesting. Thanks to both John and QT Luong for taking the time to put this together. Kudos to you, and good luck in the future. very good interview. Illuminating. Thanks. Very good article. I found the information on stock vs. print income interesting. While I do have my own stock site, I make more money from selling my fine art prints in a gallery in Jerome, AZ. It seems like things have come full circle to what I was doing in photography 35 years ago. Most of my income is from sales of articles and prints. Photography is a living, breathing thing, and will constantly change. Thanks John & Quang. Quang's photography has been an inspiration for many years, it is nice to hear the other side of his business as well. I think a humble and clever personality really supplements his wonderful images. QT Luong always provides good information and help on the business of photography, SEO and print sales. His words are always a great help to any one who wants to know how to run a successful photography business. Thank you for the very good post. The reason QT's TerraGalleria did so unbelievably WELL back in the early days, is he was spamming the heII out of high ranking Wikipedia National Park pages. This was before they caught on and put "nofollows" on every wiki page. He and others like him killed the honor system and made a lot of extra work for people Wikipedia while he pocketed a ton of money off them. Tell us what your page rank and Google Search results are when you are unethically linking to 50 sites with PRs of 6 and 7. Talk about unbridled arrogance and pure greed. I could never figure out why TerraGalleria ranked a PR of seven for many years until I checked the backlinks in 2004. Loung got rich quick off of this Black Hat SEO. Penguin has finally hammered his site traffic and high ranking last April due to his unethical SEO practices. Justice takes awhile to get here, but it will get here sooner or latter. What is funny is he claims he is a SEO expert on his blog site, he just forgot to say a black hat SEO expert. If anybodies photo site ranked #1 year after year for landscape photography, you would be one of the top outdoor photographer$ now as well. It is all about exposure, just like being on TV.